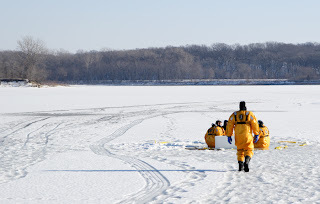 While out and about today I came across a group of West Des Moines Firefighters training for cold water rescue. I was snapping away and a Firefighter who'd already been in the water came over and asked me if I was with the paper (heh, first time I've been asked that). I told him no, that photography was just a hobby. I then asked him about the wet suits they were using and if they still got chilled while using them. He said they were quite warm and only became cold after long periods of time in the water. In fact, he was sweating around his neck when he took his suit off just a few minutes earlier. I'm glad I turned down the road I did and came across some of our bravest training for what could someday save a life. I had no idea that's what I'd find when I walked out the door. I'm glad I did. I like the way the yellow stands out from the snow, and the firemens' placement in the frame. Very cool! It's always great when we stumble across something interesting on our photography outings. It's so great to be out shooting and see something like this! Not that I've ever seen anything like this - I haven't - but you know what I mean :-) Cool that they thought you were with the paper, too! I really like the composition of this shot. Great use of the rule of thirds. I would like to see just a little more contrast in the image, as it appears a little flat for my taste. Can't wait to see what you stumble upon next.